There's a lot to unpack in the plan, and I don't have time to go through it all now, but of particular interest to the forum would be the Investments and Implementation summary. It calls for a variety of service enhancements, terminal improvements, and up to 16 new ferries, one per year starting in 2022 and going through 2037. This would fully replace the Super, Issaquah, and Jumbo classes and also expand the fleet to allow for more maintenance time and more relief ferries. 1. They plan on retiring the Issaquah's at their 50 year service life instead of 60 years. Apparently, they are having issues. I'm not surprised considering how cheaply they were built in the first place. Some of the Issaquah's will be retired before Spokane and Walla Walla. 2. Not surprising, they really like the Olympic Class design and size. Most of the newbuilds will follow this template, including a single deck 114 car version to run inter island. In looking at their newbuild chart, they list plug-in hybrid propulsion for all of the new vessels after Suquamish. ~Upsized passenger capacity on Bremerton vessels to 1800. ~Upsized passenger capacity on Bainbridge vessels to 2400. *The 144s going to Edmonds is only an option, but the write up appears to favor this in my opinion. The alternative would be two in its place. The new boat deliveries don't quite line up with the new boat assignments. 5 new Hybrid Olympics, 2 of which are SOLAS to be delivered by 2025. Then come 4 124s by 2029, followed by either 7 144s of a new design or 4 new 144s and 2 202s from 2029-2037. Not sure if the "New Sealth" is counted as one of the new 144s or not, as it is to be that design with a single level. Sounds like a Queen of Alberni sort of situation. Two relief boats are added in 2024, with an additional in 2028, finally giving the system the redundancy it needs. My only complaint here is that they keep the Tillikum instead of the Hyak until the next set of Olympics come in. 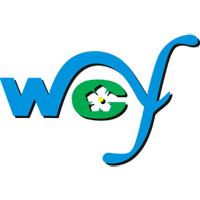 I think that decision will bite WSF many times in the mean time if they follow through with it. All terminals except for Sidney and Shaw are slated for electrification, although no date is given for Lopez. This has been interesting reading, but one thing jumps out at me... why does Southworth need another slip? If anything, another slip is needed at Fauntleroy (which is a no-go). With the Kitsap Transit ferry starting service from Southworth in 2020, is that second slip there really needed? It could be laying the foundation for breaking up the triangle route? There's been much discussion on doing this in the past, but nothing has happened. Ideally, Fauntleroy-Vashon would become a point to point service, and Southworth ferries would go directly into downtown Seattle, with a small shuttle-style ferry providing a connection between Southworth and Vashon. That's a lot of infrastructure upgrades, most especially at Colman Dock, so it's likely a full break-up of the F-V-S route is no longer in the cards, but perhaps a scaled down version, with more point-to-point service between Fauntleroy and Southworth? The problem with that scenario is the capacity constraint at Fauntleroy, but those are the two reasons I can think of for needing an additional slip at Southworth. My only complaint here is that they keep the Tillikum instead of the Hyak until the next set of Olympics come in. I think that decision will bite WSF many times in the mean time if they follow through with it. I believe Tillikum, although an older vessel, is in better condition than Hyak, and it's only one of 2 ferries of that size, Sealth being the other one; there is still a need for 87-90 car ferries, most especially with the inter-island route. Once F-V-S goes to 3 Issaquah 124's, I think we will see Sealth moved to Friday Harbor as the new permanent inter island ferry. Perhaps that will happen when Tillikum is retired, or maybe before - not sure on their timing of all of that. What’s the purpose for 2 classes of 144 car Ferries? Or will the second group of 6/7 just be an updated Olympic? The newer 144s would probably be generally similar to the Olympic class, but include some new features such as more automation, weight reduction, and support hybridization/electrification from the outset. Note that since the new 144s and the new 124s share passenger capacity and other general specs like speed, the new ferry classes are likely to be identical, except the 144s would simply be longer to increase the auto capacity. The new 144s (and 124s) are also designed with better subdivision of the passenger spaces to match passenger capacity (and hence crewing) to demand. Of some concern is a lower maximum passenger capacity: 1,200 vs 1,500 for the Olympics. This may limit the utility of the class somewhat. Personally, I'm surprised that they aren't going to be building Olympic class vessels that have a passenger capacity of 2000 like the Supers currently do. You'd think that they'd want that for the Bremerton ferry. Also, I like WSF's idea of putting three vessels on the Edmonds-Kingston run. I'd strongly support them doing that when the Jumbos are ready to be retired. They're going to want 144-car ferries with a larger passenger cabin on that run as well. Puyallup teamed up with another MkII would be 404 car spaces. 3 Olympics or similar vessels: 432 total car spaces. On the current schedule, in the middle of the day, boat 2 is scheduled for anywhere between 45 and 55 minutes between sailings. With a smaller boat, 45 minutes could be achieved on every crossing. That’s 90 minutes for a ful rotation. With three boats that is a sailing every half hour. So 144x2=388 cars per hour each way. It’s currently a 20 hour weekend sailing schedule. That equates to 7,760 cars each day each way. Current capacity is 5,070 cars each day each way. That is more than a 50% increase in vehicle capacity each day, now its likely Boat 3 starts late and ends early. So I’ll subtract 4 sailings to account for that. This leaves an Edmonds-Kingston capacity of 7,184 vehicles each way, each day with three 144 car Ferries. Versus 5,070 with one 202 car ferry and one 188 car ferry. 144 x 2 = 288, not 388. = 5,760 cars a day based on every 30 minutes. Oh my yes you’re right. And I call myself a college student. Here's a link to the revised 2040 long range plan released today - no longer a draft long range plan. > Relocation of all US Customs processing to Sidney terminal. That will free up significant space in Anacortes. There's a lot of other juicy stuff in the long range plan. Click on the link above to go deeper. Only a ferry fan would refer to the Washington State Ferries long term plan as "juicy". Don't worry, Brandon, you're in like minded company here. Pour me a glass, with extra pulp. Sealth is slated to move to SJIs as a domestic vessel in mid-March for the end of the winter schedule, and when the Spring Schedule rolls around, the Sealth will be assigned to the interisland position starting March 31. There's one item in the long range plan that I think is worth posting on its own, and that's the vessel chart with the columns showing the retirement dates for current vessels, and their age when they will be retired, upcoming new-builds, and how many vessels will be in the reserve fleet. It's a good graphic that shows a lot of information in a concise format. On the newbuild column I find it interesting that they are not calling the (6) 144's "Olympic Class" vessels; the ones slated to be constructed from 2031 to 2037. At this point in time, it may simply be leaving the door open for a different design. I also find it rather optimistic on their part to forecast a new boat every year. I doubt that will happen, but time will tell. 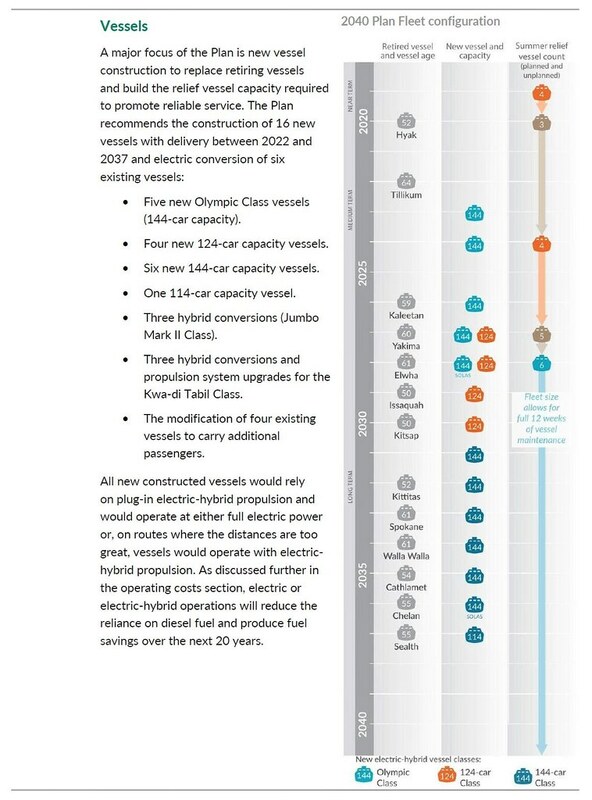 In the short to medium term, it's interesting to note the next two Olympic Class vessels, forecast to start in 2023 and 2024 respectively, do not appear to be replacing Elwha, the next logical Super Class vessel to be retired based on structural/mechanical issues. In fact, Elwha is now scheduled to be the last Super to be retired, in 2028. Chronologically, it makes since, since Elwha was the last Super built, entering service in 1968, but I thought Elwha had issues inherent to it that is "hastening it to the boneyard" as once quipped by EGFleet, more so than Kaleetan and Yakima. Did the 20 million they spent on her last year fix more than I was led to believe? Curious. Up until this report, I figured the next Olympic built would be SOLAS equipped, so it could replace Elwha. As always, I'm sure things will change over time, so I'm not treating the long range plan as gospel set in stone. After all, none of what is in the plan has been funded yet, so it will be interesting to see how the plan unfolds in real time. "Finally?" They originally didn't want it. "Within the first 10 to 15 years of the Plan, service reliability risk will be highest, in part because of the large number of retiring vessels and because of the condition of the Issaquah Class vessels, among the oldest vessels in the fleet. The Issaquah Class vessels have not had enough out-of-service time or funding to complete the preservation requirements of the Lifecycle Cost Model. As a result, at their current age of about 40 years—still a decade above industry standard for vessel lifespan of about 30 years—the Issaquah Class vessels are experiencing reliability issues and steel degradation that will shorten their attainable service life." In other words, their reliability has essentially worked them into an early grave due to the legislature's failure to fully fund the ferry system over the last two decades. The Issaquahs have been so busy having to fill in for other, older vessels being out that they've been worked to death. And of course the Issaquah is a prime example of this, having been out well over 7 months when a host of unexpected issues arose after years of putting off work on her. I know they had a rough start, but those six have been the backbone of the fleet for a long time. As for the Elwha, I wasn't surprised to see that her life has been extended. They're going to justify putting that steel into her one way or another. However, just because she's slated to work that long doesn't mean she'll make it. New steel doesn't fix the mechanical issues that plague the entire class. Also, being in the fleet that long doesn't necessarily mean working until 2028, either. She might very well end up spending a lot of time around Eagle Harbor, "at ready."